Tokyo Skytree (東京スカイツリー, Tōkyō Sukaitsurī), formerly known as New Tokyo Tower (新東京タワー, Shin Tōkyō Tawā), is a broadcasting, restaurant, and observation tower in the city of Tokyo, the capital of Japan. It is located in the special ward of Sumida, not far from the Sumida River. The nearest train station is Oshiage, which is on the Toei Asakusa Line, Tokyo Metro Hanzomon Line, and railway lines operated by Tobu and Keisei. Designed by the architects from Nikken Sekkei, a Japanese company, the process of building the tower began in 2008 and was completed on 29 February 2012. Emperor Akihito visited the tower in advance of its official opening, and the opening ceremony took place on 22 May 2012. With a height of 634 m (2,080 ft), the Tokyo Skytree is the tallest structure in Japan. This height was chosen because it could be easily remembered. The figures 6 (mu), 3 (sa), 4 (shi) stand for Musashi Province, which is an old name of the region where the tower stands. It is the second tallest structure in the world after Burj Khalifa in Dubai. 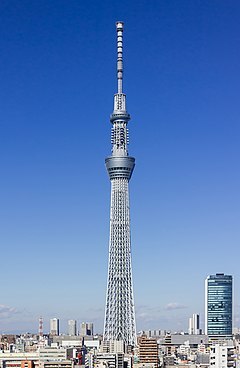 It is also the tallest tower in the world, according to the Council on Tall Buildings and Urban Habitat, because there is no space in the Skytree for people to live or work in, unlike the Burj Khalifa. All of central Tokyo can be seen from special viewing platforms at 350 m (1,150 ft) and 450 m (1,480 ft). At night, it is lit up with different coloured lights. ↑ 2.0 2.1 "Tokyo Sky Tree". Skyscraper Source Media. Retrieved November 14, 2016. ↑ 3.0 3.1 3.2 Agence France-Presse (AFP). "Japan finishes world's tallest communications tower," Bangkok Post. February 29, 2012; retrieved 2012-4-26. ↑ "Japanese Emperor visits Tokyo Sky Tree ahead of opening," Xinhua. April 26, 2012; retrieved 2012-04-26. ↑ Nakata, Hiroko, "Tokyo Sky Tree opener looms large," Japan Times, 21 February 2012; retrieved 2012-4-26. ↑ Council on Tall Buildings and Urban Habitat, "Japan Finishes World's Tallest Communications Tower," 1 March 2012; retrieved 2012-4-26. ↑ ctbuh. "History of Measuring Tall Buildings". www.ctbuh.org. Retrieved 2018-02-26. ↑ "10 Tallest Towers In The World - 10 Most Today". 10 Most Today. 2013-07-05. Retrieved 2018-02-26. This page was last changed on 1 March 2018, at 01:19.